When you rez Chimera, choose sentry, code gate, or barrier. Chimera gains that subtype until derezzed. When a turn ends, derez Chimera. Three heads. One big headache. Stops the runner from entering its server unless he has an AI breaker or a full suite of breakers. Really good at slowing down Criminal decks, Stops big-rig Shaper decks cold earlygame unless they run an AI breaker, may force Anarch decks to spend their ice removal. Usually Chimera is a super speedbump, either the runner has all of his breakers on the table or he's not getting in, but when the breakersuite is up and running it becomes more expensive for you to rezz Chimera then it is for them to break it. Often in the first rounds of a game the runner will install a killer if he is worried about damage, or a defracter if he is desperate to access what he believes to be an agenda. Chimera will stop both of them equally. Even if a runner gets all of his icebreakers into his hand early it will still cost him a few rounds to set them all up. -Countered by AI breakers. Darwin Overmind, Alpha and Omega laught at it, Eater makes it look silly (so dont put it on R&D if you suspect youre facing an Eathole, in this matchup it is still good on HQ or remotes). 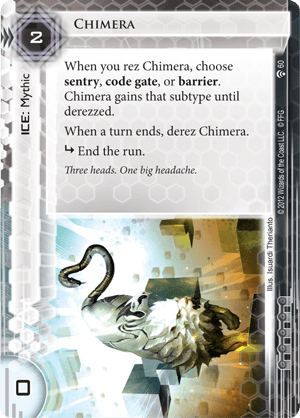 Crypsis breaks it for 1 and 1, Wyrm breaks for 3, against those 2 you may rezz Chimera as a tax. -Bad synergy in decks with lots of ice, those decks can reasonably field one of every type of ice on important servers and those ice will tax the runner more then Chimera ever could. -Good synergy in decks that want earlygame ETR but dont want to spend card-space on multiples of cheap ice (Saves you the influence on Ice Wall if you're only including it to block access earlygame)). -Fairly weak as the only ice on a server. The runner may run the Chimera, you choose a type for it, then he installs that type and runs again. This is mitigated by having more ice, especially if you decide to layer one Chimera after another. -Expensive in the long run, re-rezzing it between turns can become a drain on . Spending creds is a small price to pay to immunize a server from early runner access though. Like all ice it inflates the price of installing on its server, but unlike other ice it may become useless later in the game. Nobody wants useless unrezzed ice in the middle of their server. -Tricky for the runner to affect with some card effects, Paintbrush and Parasite for example require the target ice to be rezzed, which means the runner has to spend a click and possibly resources to dig down to the Chimera to get it rezzed, then another click to affect it with the desired effect, and then probably yet another click for the runner to access the until now locked server. -Interesting interaction with combo ice like Chum. Because Chimera de-rezzes itself you can put it inbetween Chum and another ice. A brave runner with 1 or 2 breakers out might check Chum and keep going thinking he can break the next ice, only to meet with an ubreakable Chimera. -Good with effects that remove programs, any program trash, Wendigo and Will-o'-the-Wisp combined with Chimera can make entering servers a nightmare. Chimera is'nt perfect. It has a limited lifespan against most runners and may cost more credits to operate then you care to spend. AI breakers counter it. On the other hand, when it works it works amazing, locking out the runner from a server if only momentarily. This is one of those cards you use all the time when you get used to it, or never use at all if you cant make yourself fall in love with it the first time. Best run as a 3-of to have a reasonable chance to draw it early.